Who are you and what is real? Quite by chance I have read a series of books recently which, whilst all being very different, have all had a spooky continuity. They have all asked questions about reality and identity, and involved stories about people trying to find themselves and get back home. The first book, Nowhere Boys by Elise McCredie, is based on an Australian television drama series [by Tony Ayres and Beth Frey] that won the Australian Film Institute Award for best Children’s Television Drama in 2013. It is a fantasy adventure about four very different teenage boys who spend a night in the bush when a school excursion goes wrong. But when they return home, they discover that they are trapped in a parallel world where no one recognises them and they no longer exist. What has happened? Is it magic? Is it demons? Why has this happened? and how are they going to get home? The second book, Flip is Martyn Bedford“s first young adult novel [although he has published five novels for adults]. Flip is a much more intense psychological thriller about a boy called Alex who wakes up one morning to find himself trapped in the body of someone else; this person shares the same birthday but nothing else. He lives in very different part of the country, he has a sister not a brother, he is popular, he is good at sports and he has lots of girlfriends. Alex knows that at his core he is not Philip, or Flip, but where is his “unique inner essence”, is he really a “psychic evacuee” and how can he return to his family? The third and final novel I read was More Than This by Patrick Ness. It has been described as a “tense thriller” about “love and survival.” Our copy in the library has a lovely message at the front of the book from the author especially for Australian and New Zealand readers! In it he explains that this book started as an idea in his head whilst he was in our “part of the world”. More Than This begins with Seth drowning; then he wakes up. Where is he? Is he in hell? Is he dreaming? Is he living in his imagination? Little by little we find out about Seth as he tries to reconcile his past with his present. I wont spoil your delight of discovery by telling you any more, but I would say that this book is perhaps the most demanding and challenging read of the three. 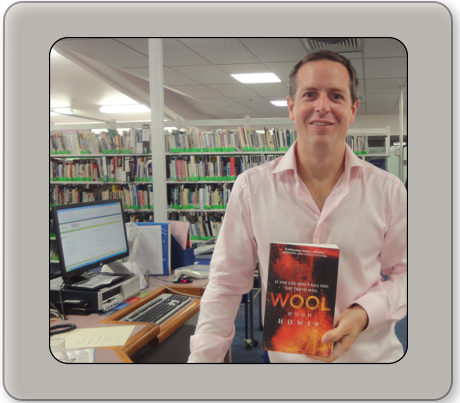 The Wool series by Hugh Howey is a book with no sheep! The wool in the title refers to the saying “to pull the wool over somebody’s eyes” in other words, to deceive someone in order to prevent them from discovering something. It has a wide appeal for all sorts of readers and is an exciting mystery. It is also a thriller set in a dystopian, science fiction world about a group of people living underground. In publishing terms Wool is unusual because it evolved as a short story in eBook format published online in instalments on Amazon. It became popular with readers who sent emails asking for more, and so the story “took off” and eventually ended up as a single volume in print. In this way it is a mixture of the old and the new. Many years ago Charles Dickens (1812 – 1870) published his stories in weekly, or monthly instalments in journals, and then modified what he wrote according to the feedback he received. Would he have enjoyed the direct relationship with his readers that online publishing, twitter and blogs provide authors like Hugh Howey today? On Monday evening I was lucky enough to hear him speak and he told us that amongst other things he has been a sailing captain and worked in construction. He described life on board a boat as Captain as not all glamorous quite often it involves living below deck fixing the engines and unblocking the head (toilet) in order to facilitate the good life for others enjoying life above deck. He has seen both sides – the life of billionaires and ordinary workers. Even though Wool has been his greatest success so far, he has written many books, and says, “Finishing your first book is an incredible feeling; like climbing a mountain.” Wool took three months to write and was an enjoyable experience. The reaction you have to your writing he says is a good indication of how others may also enjoy the story. His writing day is usually 6 to 11 a.m. every day. He uses a computer to write, and with tongue in cheek he says that using your right hand to write with a pen makes you use the logical side of your brain, whereas two hands on the computer uses both sides of the brain and is more creative. Some writers “follow” their stories as they write them not knowing where they will end, and others like to frame their writing within a plot. Hugh Howey says that he falls into the “plotter” camp and likes to start at the end, so that he knows where the story is going. Authors that Hugh Howey admires and enjoys include Mark Twain (for his satire and humour), Peter F. Hamilton, Neil Gaiman and Neal Stephenson who wrote Cryptonomicon (about people in different time periods). Film rights to the Wool series have been sold to 20th Century Fox with English film director and producer Ridley Scott (Alien, Prometheus, Blade Runner, Gladiator), and a screenplay is currently being written, although Hugh Howey is not allowing himself to get too excited in case it never happens. Perhaps this trailer will have to do until then.